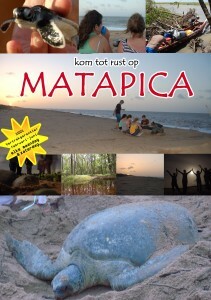 www.matapica.com officiële website voor tour naar de zeeschildpad! Booking of this tour can be online at www.matapica.com or at one of our sales locations! Matapica is a piece of nature that is in the district Commewijne. Matapica is known for the four different types of turtles that in the egg laying season throw their eggs. Also Matapica is a paradise for birders, it is in fact a breeding ground for many bird species. On the way to Matapica we will go through Marienburg, which lies on the Commewijnerivier. From here we take a boat to the plantation “Johanna and Margaretha”. Here we transfer to smaller swampboats toward the beaches of Matapica. This trip through the swamp is about 20 km long. When we arrive we install ourselfs first. Then you can enjoy the delicious water. The turtles lay their eggs day and night.You will witness this unique spectacle. The second day we can just relax on the beach and in the afternoon we leave heading back to Paramaribo.